The Saw is a light compact hand-saw that lets you cut almost any material in both straight line and in curved line. In the use of saw blade grinding saws, knives or cutting tiles and glass and other hard materials, different blades for different purposes. The Angle-izer is the perfect tool to make bulls eyes, arches and plumb cuts on roof joists. Whether you're a professional builder, craftsman, weekend warrior or DIYer, the Angle-izer, template tool will eliminate tedious, repetitive measures and materials made from inaccurate cuts. Save time and money, is an essential tool for any toolbox! Do not pull the tool's limbs by brute force; Loose down the screw when you need a flexible angle. 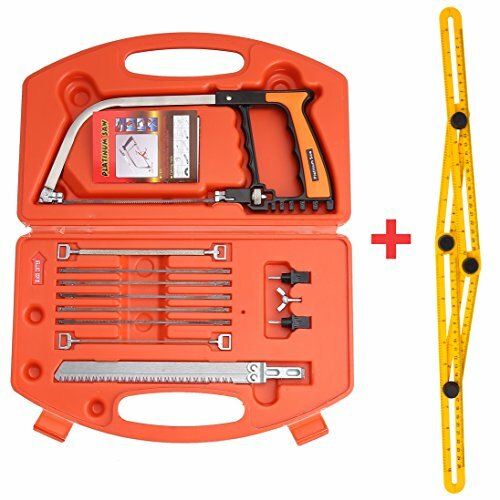 [What will you get]: Magic Saw blade ×4 (for genal & wood), Angle Measuring Ruler ×1, Tile drill ×2(for tile, soft metal ect. ), Glass saw blade ×2, Large wood saw blade×1, Magic Saw body×1, Screw×1, storage case ×1. [Portable]: All Bow Saw come in a nice storage case, so it's easy to carry. The individual items stay secure in their spot, the blades are extremely easy to change too, makes cutting things so quick. And the fold ruler can be easily folded and carried to your next project. [Widely Use]: The perfect saw tool for cutting in construction, decoration, handicraft processing, pruning fruit trees and other industries.And with the Angle-Izer, creating professional layouts in tiles, brick pavers, lumber and laminate. [Various Specifications]: When sharpen it through a sharpener, sharpening for knife, scissors, glass, etc (Diamond sharpening blade).When use saw blade grinding saws, knives or cutting tiles and glass and other hard materials. [Easy To Use]: Just place onto your work area, slide the rulers into the shape you need, and tighten the screws. Then you have your flawless measurement which can now be transferred and traced onto any materials. If you have any questions about this product by SILIVN, contact us by completing and submitting the form below. If you are looking for a specif part number, please include it with your message.